Some ski areas attract people by laying claim to a superlative or two: steepest terrain, gnarliest lines, most skiable acres, deepest snow, most vertical, hottest girls, best hamburgers, etc. And then there are the ones that beckon you for “lesser” reasons: off the beaten path, compelling back story, unique ambiance, or an interesting name. Pajarito is one of the latter group. Perched on the eastern edge of north central New Mexico’s Jemez Mountains, Pajarito (“little bird” in Spanish) had been on my ski-area watch list for years. 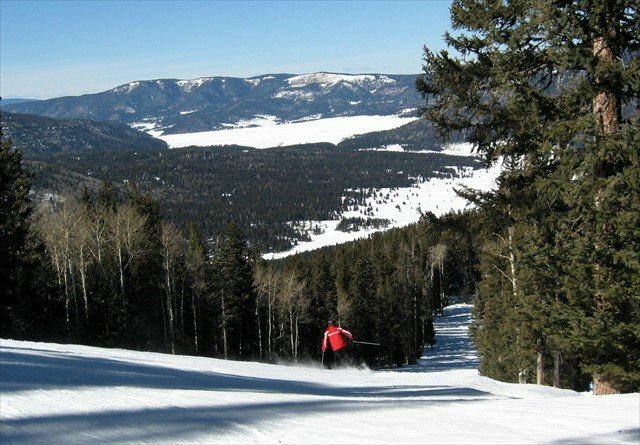 Even though I always roll my eyes upon hearing any ski area described as a region’s “best-kept secret,” Pajarito may actually earn this distinction due to it only being in operation on Fridays, Saturdays, Sundays, and holidays. 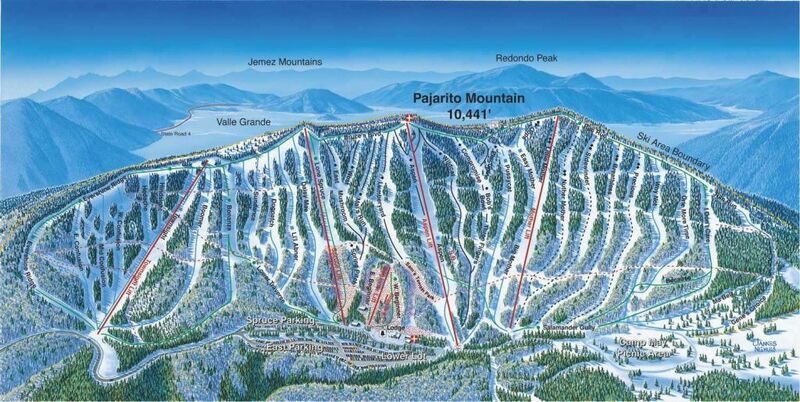 Oddly enough, most ski tourists (and many natives) couldn’t pick Pajarito out of a police lineup, but with trails that can be clearly seen from the busy Route 84 corridor between Santa Fe and Taos, it may be New Mexico’s most visible lift-served mountain. 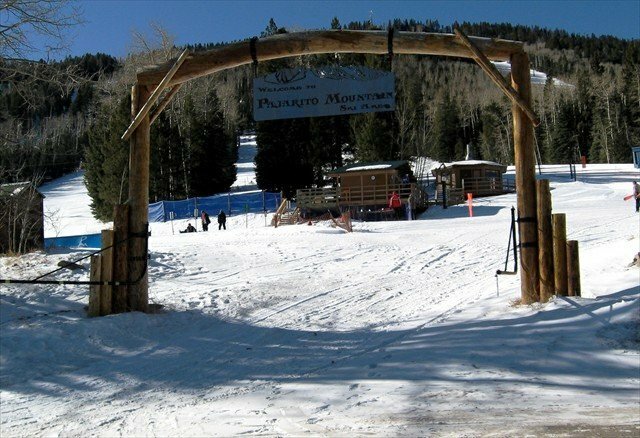 Pajarito was developed in the late 1950s by the Los Alamos Ski Club and has operated ever since as a non-profit organization with more than 2,000 members — however, anyone can buy a day pass or a season ticket. Similar to Vermont’s Mad River Glen, most major decisions need the approval from a board of directors and a member vote. And just like MRG, while this setup can occasionally lead to contentious discussions among members, it also fosters a “labor of love” ambiance in which members make the decisions that guide the mountain’s growth. Several people I met told me stories about volunteer work parties they’d participated in to create new terrain, maintain existing trails and glades, and build a variety of on-mountain infrastructure, including stairways, fences, and structures. For an interesting step-by-step description of Pajarito from 1957 to today, there’s a chronological photo exhibit in the lodge showing every phase of the ski area. The fact that lifts are closed from Monday through Thursday usually guarantees some untouched powder for anyone who can get up there on a Friday morning. 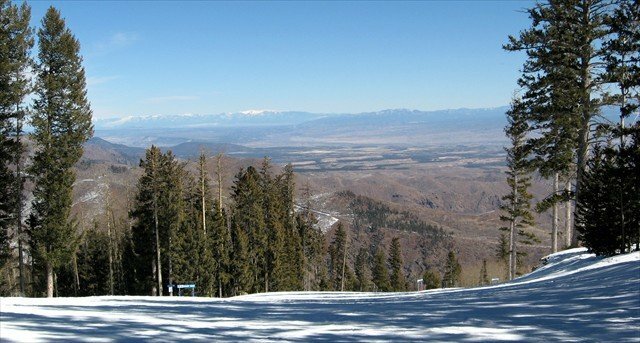 In addition, from various vantage points throughout the mountain, you’ll have stunning views of three different mountain ranges: the Sangre de Cristos from Santa Fe in the east all the way to Colorado in the north, the Sandias to the southeast, and the Jemez to the west. Along “Rim Run,” a rolling green trail on the far skier’s left, there’s an incredible vista of the Valles Caldera, a 12-mile-wide cauldron-like feature created after a massive volcanic eruption. Like most ski areas, getting a tour from an informed local pays big dividends. 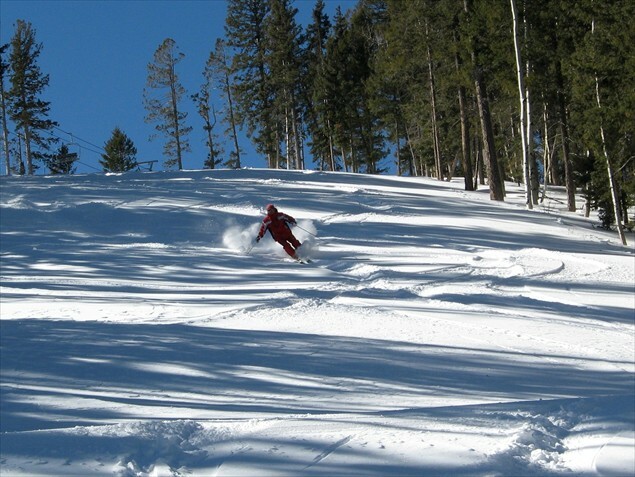 During my day there, I was lucky enough to ski with General Manager Tom Long and Ski School Supervisor John Viney, who not only introduced me to Pajarito’s bread and butter (cozy, consistently-pitched cruisers), but also some great tree shots, powder stashes, steeps, and the challenging “Fab Four” mogul runs. While some might grouse about Pajarito’s shortcomings (most of the trails have a similar, almost East Coast-ish ridgeline layout; there’s no open bowl skiing; the longest sustained vertical is approximately 1,100 feet; annual snowfall averages only 150 inches), in my opinion, they’re missing the point. Pajarito isn’t the type of ski area that delivers superlatives. Instead, it scores points on the little things: no crowds, a rustic anti-resort ambiance, and a stunning only-in-New-Mexico setting. Here’s a short news report from Albuquerque’s KOAT-TV.